Henry IV depicted in Cassell's "History of England"
Henry IV (April 3, 1367 – March 20, 1413) was the King of England and France and Lord of Ireland 1399–1413. He was born at Bolingbroke Castle in Lincolnshire, hence, the other name by which he was known, Henry Bolingbroke. His father, John of Gaunt, was the third son of Edward III, and enjoyed a position of considerable influence during much of the reign of Richard II. Henry's mother was Blanche, heiress to the considerable Lancaster estates. While abroad on a Crusade, his father died. Richard used the opportunity to seize the Lancastrian estates that belonged by right to Henry. Upon his return, Henry used the opportunity of Richard's absence (in Ireland) to reclaim his properties, attracting the support of others in the aristocracy who felt threatened by Richard, and "who were concerned that their rights of inheritance might be endangered as Henry's had. By the time Richard returned to London he had no support left, and he abdicated; Henry was subsequently declared king by Parliament." Henry was never able to fully remove the sense that he was a usurper and his reign, the first in the Lancastrian dynasty, planted the seeds for the Wars of the Roses. One of his elder sisters, Philippa, married John I of Portugal, and his younger sister Elizabeth was the mother of John Holland, 2nd Duke of Exeter. His younger half-sister Catherine, the daughter of his father's second wife, Constance of Castile, ruled as co-consort of Castile, by marrying Henry III. He also had four half-siblings by Katherine Swynford, his sisters' governess and his father's longtime mistress and eventual third wife. These four children were surnamed Beaufort. Henry's relationship with Katherine was always a positive one (she was governess to him and his sisters in youth). His relationship with the Beauforts varied considerably. In youth he seems to have been close to them all, but rivalries with Henry and Thomas Beaufort after 1406, proved problematic. His brother-in-law, Ralph Neville, remained one of his strongest supporters. 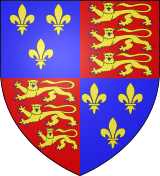 So did his eldest half-brother, John Beaufort, even though Henry revoked Richard II's grant to John of a marquessate. Thomas Swynford, a son from Katherine's first marriage to Sir Hugh Swynford was another loyal companion and Constable of Pontefract Castle, where King Richard II is said to have died. Eventually, a direct descendant of John of Gaunt and Katherine Swynford through the Beaufort line would take the throne as Henry VII. Henry experienced a rather more inconsistent relationship with King Richard II than his father had. They were first cousins and childhood playmates; they were admitted together to the Order of the Garter in 1377, but Henry participated in the Lords Appellant's rebellion against the King in 1387. After regaining power, Richard did not punish Henry (many of the other rebellious Barons were executed or exiled). In fact, Richard elevated Henry from Earl of Derby to Duke of Hereford. Henry spent a full year of 1390 supporting the unsuccessful siege of Vilnius (capital of the Grand Duchy of Lithuania) by Teutonic Knights with his 300 fellow knights. During this campaign Henry Bolingbroke also bought captured Lithuanian princes and then apparently took them back to England. Henry's second expedition to Lithuania in 1392 illustrates the financial benefits to the Order of these guest crusaders. His small army consisted of over 100 men, including longbow archers and six minstrels, at a total cost to the Lancastrian purse of £4,360. Much of this sumbenefitedd the local economy through the purchase of silverware and the hiring of boats and equipment. Despite the efforts of Bolingbroke and his English crusaders, two years of attacks on Vilnius proved fruitless. In 1392–1393, Henry undertook a journey to Jerusalem where he gained a reputation as a seasoned warrior and courtier. However, the relationship between Henry Bolingbroke and the King encountered a second crisis in 1398, when Richard banished Henry from the kingdom for ten years after a duel of honor was called by Richard II at Gosford Green near Coventry. Before the duel could take place, Richard II banished Henry from the kingdom (with the approval of Henry's father, John of Gaunt) to avoid further bloodshed between Henry and Thomas de Mowbray, 1st Duke of Norfolk, who was exiled for life. John of Gaunt died in 1399, and without explanation, Richard cancelled the legal documents that would have allowed Henry to inherit Gaunt's land automatically; instead, Henry would be required to ask for the lands from Richard. After some hesitation, Henry met with the exiled Thomas Arundel, former (and future) Archbishop of Canterbury, who had lost his position because of his involvement with the Lords Appellant. Henry and Arundel returned to England while Richard was on a military campaign in Ireland. With Arundel as his adviser, Henry Bolingbroke began a military campaign, confiscating land from those who opposed him and ordering his soldiers to destroy much of Cheshire. Henry quickly gained enough power and support to have himself declared King Henry IV, to imprison King Richard, who died in prison under mysterious circumstances, and to bypass Richard's seven-year-old heir-presumptive, Edmund de Mortimer. Henry's coronation, on October 13, 1399, is notable as the first time following the Norman Conquest that the monarch made an address in English. Henry consulted with Parliament frequently, but was sometimes at odds with the members, especially over ecclesiastical matters. On Arundel's advice, Henry passed the De heretico comburendo and was thus the first English king to allow the burning of heretics, mainly to suppress the Lollard movement. Henry's first problem was what to do with the deposed Richard, and after an early assassination plot (The Epiphany Rising) was foiled in January 1400, he ordered his death (very probably by starvation). The evidence for this lies in the circulation of letters in France demonstrating prior knowledge of the death. Richard died on February 14, 1400, and his body was put on public display in the old St Paul's Cathedral to prove to his supporters that he was dead. He was 33 years old. Henry spent much of his reign defending himself against plots, rebellions, and assassination attempts. Rebellions continued throughout the first ten years of Henry's reign, including the revolt of Owain Glyndŵr, who declared himself Prince of Wales in 1400, and the rebellion of Henry Percy, 1st Earl of Northumberland. The king's success in putting down these rebellions was due partly to the military ability of his eldest son, Henry of Monmouth, who would later become king, though the son (who had maintained a close relationship with Richard II) managed to seize much effective power from his father in 1410. In the last year of Henry's reign, the rebellions picked up speed. "The old fable of a living Richard was revived," notes one account, "and emissaries from Scotland traversed the villages of England, in the last year of Bolingbroke's reign, declaring that Richard was residing at the Scottish Court, awaiting only a signal from his friends to repair to London and recover his throne." A suitable-looking impostor was found, and King Richard's old groom circulated word in the city that his old master was alive in Scotland. "Southwark was incited to insurrection" by Sir Elias Lyvet (Levett) and his associate Thomas Clark, who promised Scottish aid to carry out the insurrection. Ultimately the rebellion came to naught. The knight Lyvet was released; his follower thrown into the Tower. 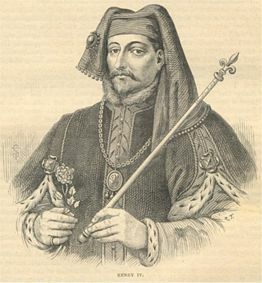 Early in his reign, Henry hosted the visit of Manuel II Palaiologos, the only Byzantine emperor ever to visit England, from December 1400 to January 1401, at Eltham Palace, with a joust given in his honor. He also sent monetary support with him upon his departure to aid him against the Ottoman Empire. In 1406, English pirates captured the future James I of Scotland off the coast of Flamborough Head as he was going to France. James remained a prisoner of Henry for the rest of Henry's reign. The later years of Henry's reign were marked by serious health problems. He had a disfiguring skin disease, and more seriously suffered acute attacks of some grave illness in June 1405, April 1406, June 1408, during the winter of 1408–09, December 1412, and then finally a fatal bout in March 1413. Medical historians have long debated the nature of this affliction or afflictions. The skin disease might have been leprosy (which did not necessarily mean precisely the same thing in the 15th century as it does to modern medicine); perhaps psoriasis; perhaps a symptom of syphilis; or some other disease. The acute attacks have been given a wide range of explanations, from epilepsy to some form of cardiovascular disease. It is said in Holinshed (and taken up in Shakespeare's play) that it was predicted to Henry he would die in Jerusalem. Henry took this to mean that he would die on crusade, but in fact it meant that, in 1413, he died in the Jerusalem Chamber in the house of the Abbot of Westminster. He died with his executor Thomas Langley at his side. Unusually for a King of England, he was buried not at Westminster Abbey but at Canterbury Cathedral, on the north side of what is now the Trinity Chapel, as near to the shrine of Thomas Becket as possible. (No other kings are buried in the Cathedral, although his uncle Edward, the Black Prince, is buried on the opposite, south side of the chapel, also as near the shrine as possible.) At the time, Becket's cult was at its height, as evidenced in the Canterbury Tales written by the court poet Geoffrey Chaucer, and Henry was particularly devoted to it. (He was anointed at his coronation with oil supposedly given to Becket by the Virgin Mary and that had then passed to Henry's father). Henry was given an alabaster effigy, alabaster being a valuable English export in the 15th century. His body was well-embalmed, as a Victorian exhumation some centuries later established. Before his father's death in 1399, Henry bore the arms of the kingdom, differenced by a label of five points ermine. After his father's death, the difference changed to a "label of five points per pale ermine and France." Upon his accession as king, Henry updated the arms of the kingdom to match an update in those of royal France—from a field of fleur-de-lys to just three. When Richard II resigned the throne in 1399, there was no question of who was highest in the order of succession. The country had rallied behind Henry and supported his claim in parliament. However, the question of the succession never went away. The problem lay in the fact that Henry was only the most prominent male heir. This made him heir to the throne according to Edward III's entail to the crown of 1376 but, as Dr Ian Mortimer has recently pointed out in his biography of Henry IV, this had probably been supplanted by an entail of Richard II made in 1399. Henry thus had to remove Richard II's settlement of the throne on their uncle York (Edmund of Langley) and Langley's Yorkist descendants and overcome the superior claim of the Mortimers in order to maintain his inheritance. This fact would later come back to haunt his grandson, Henry VI of England, who was deposed by Edward IV, son of Richard Plantagenet, Duke of York, during the Wars of the Roses. The following are the senior descendants of Edward III. Note: It is incorrect to presume that female inheritance of the throne was possible at this time: The only precedent (the succession in 1199) suggested to lawyers that it was not. The descendants that were alive at the death of Richard II are in bold. Philippa of England (1394-1430) married in 1406 Eric of Pomerania, king of Denmark, Norway and Sweden. Mary died in 1394, and on February 7, 1403, Henry married Joanna of Navarre, the daughter of Charles d'Evreux, King of Navarre, at Winchester. She was the widow of John V of Brittany, with whom she had four daughters and four sons, but she and Henry had no children. The fact that in 1399 Henry had four sons from his first marriage was undoubtedly a clinching factor in his acceptance onto the throne. By contrast, Richard II had no children, and Richard's heir-apparent Mortimer was only seven years old. Henry's reign was a significant moment in English history. The fall of Richard created a rift among those who supported him and those who saw him as potentially a dangerous ruler who would strengthen the monarchy at the expense of the rest of the aristocracy. The problem would not be fully resolved until the Wars of the Roses. Henry was the father of the "hero king," Henry V of England. The reign of Henry was the subject of two plays by William Shakespeare, "Henry IV, Part I and "Henry IV, Part II." These two plays are the middle part of a tetralogy which begins with "Richard II" and ends with "Henry V."
In Shakespeare's version, Henry Bolingbroke – now King Henry IV – is having an unquiet reign. His personal disquiet at the means whereby he gained the crown—by deposing Richard II—would be solved by a journey or crusade to the Holy Land to fight Muslims, but broils on his borders with Scotland and Wales prevent that. Moreover, his guilt causes him to mistreat the Earls Northumberland and Worcester, heads of the Percy family, and Edmund Mortimer, the Earl of March. The first two helped him to his throne, and the third was proclaimed by Richard, the former king, as his rightful heir. Adding to King Henry's troubles is the behavior of his son and heir, the Prince of Wales. Hal (the future Henry V) has forsaken the Royal Court to waste his time in taverns with low companions. This makes him an object of scorn to the nobles and calls into question his royal worthiness. Hal's chief friend and foil in living the low life is Sir John Falstaff. Fat, old, drunk, and corrupt as he is, he has a charisma and a zest for life that captivates the Prince, born into a world of hypocritical pieties and mortal seriousness. Despite the fact that Henry is title character in the two history plays, Shakespeare's creation, Falstaff, steals every scene in which he appears, and Shakespeare's emphasis is on the "coming of age" story of Prince Hal, who would later become the hero-king, Henry V.
↑ About.com, Henry IV of England. Retrieved November 3, 2008. ↑ Mortimer, Fears of Henry IV, 211-7. ↑ Dr. John Doran, The Book of the Princes of Wales, Heirs to the Crown of England. Retrieved October 18, 2008. ↑ Peter McNiven, "The Problem of Henry IV's Health, 1405–1413," English Historical Review 100 (1985): 747–772. ↑ Debbi Codling, "Henry IV and Personal Piety," History Today 57:1 (January 2007): 23-29. ↑ Heraldica.org, Marks of Cadency in the British Royal Family. Retrieved October 18, 2008. Buisseret, David. Henry IV. G. Allen & Unwin, 1984. ISBN 9780049440128. McNiven, Peter. "The Problem of Henry IV's Health, 1405–1413," English Historical Review 100 (1985): 747–772. ISSN 0013-8266. Mortimer, Ian. The Fears of Henry IV: the Life of England's Self-Made King. Jonathan Cape, 2007. ISBN 9780224073004. History of "Henry IV of England"
This page was last modified on 16 December 2017, at 17:03.